← One Thousand Posts Today!!! 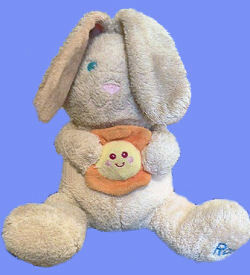 I am looking for a KIDS II 2002 stuffed bunny that sings You Are My Sunshine. I gave my nephew this bunny years ago. It is a pale yellow bunny with the word RAE on the foot, and it is holding a flower between its paws. It has broken, and he would like a replacement for his birthday. If you can find one, and it is below $20.00 please let me know. I hope someone out there has one. It would make a little boy very happy. Thanks for helping with the search Ally! She’s not able to pay that much, however. Hopefully someone will be able to help Sue with one in her price range.